The essential Whisky glass for quintessential taste. You haven't tasted Whisky till you've experienced Glencairn crystal. Considered the "Official Whisky Glass" by the experts, the Glencairn glass is custom-shaped to express Whisky's truest flavors and aromas. The essential Whisky glass for quintessential taste. You haven't tasted Whisky till you've experienced Glencairn crystal. Considered the "Official Whisky Glass" by the experts, the Glencairn glass is custom-shaped to express Whisky's truest flavors and aromas. The wide bowl makes it perfect for serving with ice or mix, or if you prefer, neat and clean. Etched with the Canadian maple leaf on the bottom. Machine-made of lead-free crystal. Dishwasher safe. What's the diameter of this glass's opening, when compared to the glencairn whisky glass ( http://www.wineenthusiast.com/glencairn-whisky-glasses-(set-of-4).asp )? Is it the same, or more? 4 1/2" high, holds 6oz and the mouth is 1.81 in diameter. Can these glasses be initialized? BEST ANSWER: Yes, I bought a set of these for my son-in-law who loves a good bourbon occasionally and had the first initial of his last name engraved on them. He loved them. The Glencairn Wide-Bowl Whisky Glasses CAN be personalized. The item number is 780 11 58. Absolutely! We had initials engraved on a set of four. Is engraving available on the wide bowl glasses? BEST ANSWER: Look on ebay too. They come with engravings already on them. I am sure if you are willing to pay for it that you could get a new set engraved. yes it is - the glasses are very beautiful and more than met my expectations. My husband, the Scotch drinker, loves them. Thank you for your question, the personalized on the Wide Bowel glasses is Item # 780 11 58. To "Long time customer in Atlanta"
I use these delightful glasses for neat sipping and on the rocks enjoyment of all whiskeys. I have never known a true "Connoisseur" who would quibble over a $10.00 glass unless, of course, he entertains in a museum. LOL, I live in a home so, Atlanta "Connoisseur" - Get Over Yourself! I ordered a beautiful scotch/whiskey decanter for my son-in-law for Christmas with his initial engraved in it and it had a pewter bear head for a top (which was perfect since he's in medical school at UCLA) go Bruins! But he did not have any nice glasses to drink his aged scotch out of, until I saw these in the catalog and figured he would like them. He said "they were perfect" and he absolutely loved them. Love having both Glencairn styles! One glass arrived broken. Wine Enthusiast's customer responsiveness was excellent. I think we received a replacement glass within a week! Good for any on the rocks drink! We own a set and just bought one as a Christmas gift for friends. We recommend washing by hand. One of ours chipped, but it was probably due to our carelessness. Great looking glasses, you won't be disappointed. Nice glasses...bought these for my husband as a holiday gift along with several bottles of bourbon and he loves them. Nice design, good weight. Would recommend. My husband loves his Whisky glasses but we're both disappoint how fragile they are. I would recommend them for yourself but not for a evening party. I am just getting into drinking Scotch. I had read many online reviews and there were two glasses that seemed to be everyone's favorites. I had it narrowed down to the one I was going to get but I wanted a glass that I could also drink other alcoholic beverages from and not just be task specific. I came across the big bowl Glencairn and it seemed to be the perfect match. I really like them and they make a great glass whether you are nosing a Scotch or mixing a Bourbon drink. The glass were perfect; good quality, and beautifully shaped. They were a gift and the recipient loved them. My wife received the glasses for Christmas and has put them to good use. She loves them and would even buy them for herself. Certainly recommend purchasing them. Beautiful, great way to drink whiskey!!! The shape of the glass really accentuates the aromas. Best whiskey glass or best glass for whiskey? I never thought much about the glasses I served whiskey in until I bought my first set. My husband and I both liked and used them. On day a friend came over and he raved about how easy they were to hold and swirl the whiskey in. Unfortunately on got broken and I was compelled to buy two sets this time, one for that friend and one for us. We thoroughly enjoy, the looks, the feel of the glass in our hand, and the complements that arise when we use them wit friends. 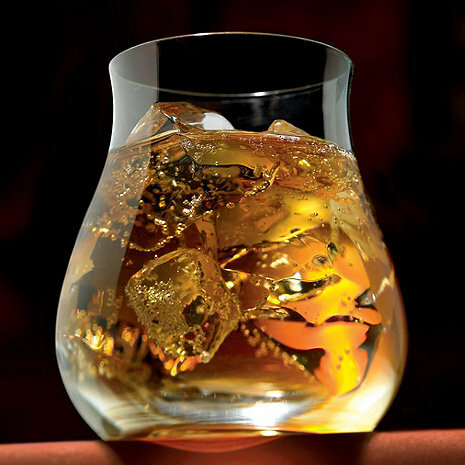 Nice rocks glasses for Canadian whiskey or I could also use them for bourbon. These were exactly what I was looking for. Just the right size. My friends were very impressed! The best whisky glass I've tasted from! The perfect whisky glass for a single malt scotch neat, or a single barrel bourbon on the rocks! It allows the whiskey to breath and you enjoy all the flavors. My favorite drink is Crown Royal and this glass is perfect for it. I bought these for my father for Christmas because he loves his whiskey. I was very surprised at the feel and look of them. They were very sturdy and a great looking glass. I'm thinking about buying some of them for myself!!! Great product! These are a great addition to my glasses. Whiskey "nosing " never got better ! Very pleased with service & delivery.Great price for a good product. Single malt whiskey tastes better. Liked these better than the Riedel single malt glasses !!! Very fast delivery, very well packaged for protection. "Ordered personalized sets for friends"
Once you use these glasses, you'll understand. A few days after receiving my first set, I ordered personalized sets for my friends. They'll be a much appreciated gift. We would buy this product again. We are 100% pleased with these glasses. We are proud to serve our guests with them. These glasses fit perfectly in your hand, warming the whisky and the shape brings the smell to your nose as you drink. Brings out the best in your whisky. Size and shape are useful for whiskey or wine. Fits the smaller hand better than other stemless wineglasses. Heavy base decreases opportunities for tipping over. The glasses are very comfortable in the hand. They are well made, I just wish the walls were a little thicker. A beautiful glass for your favorite single malt. Clever design of a glass! Very nice, will make a wonderful Christmas present. I love the look and feel of the Glencairn whiskey glasses. They add the perfect touch to enjoying your favorite whiskey on ice.. Very nice glass and good quality. Relatively quick delivery. Glasses have maple leaf etched on bottom of glass. This larger volume glass allows ample space for the single malt scotch and a few "arctic rocks" for cooling. Heavier and more substantial than riedel glasses. Haven't put in dishwasher yet, but as with the riedels, I will. Evidently, the shape of the glass is important to serious single malt scotch tasters and this one fits the bill. took a while to deliver two weeks. The etching on the bottom looks beautiful through the scotch. Guests were impressed with this glass. Fits nicely in all sizes of hands. Appears delicate but not too much. I was thrilled with this purchase and would highly recommend this glass to others. I would purchase this product again! It would be nice to have more weight at the bottom and a slightly thicker lip because if you are making a toast, you could possibly chip the rim. Glencairn whisky glasses are Number one! Perfection! Ideal for all Whisky and spirits. Excellent for drinking my Whisky!! We have used Reidel whiskey glasses and find they are too delicate/break easily. These glasses are attractive,serve the same function and are much more durable. I bought the glasses as a gift for my husband who likes to sip bourbon. These are so much more attactive than other whiskey glasses with the pedistal. They're so stylish and great quality for a reasonable price. Great, practical and stylish glass! These Scotch and Whisky glasses are awesome. The cool and stylish design make the drink more enjoyable and in style. The glasses are light, great design that fit in your hand and well made. I recommend them! Looks good, good weight, easy to hold. Have several sets of these whiskey glasses and have bought more as gifts. A class act!